The word “hacks” is something I debated over using in the title of this article. 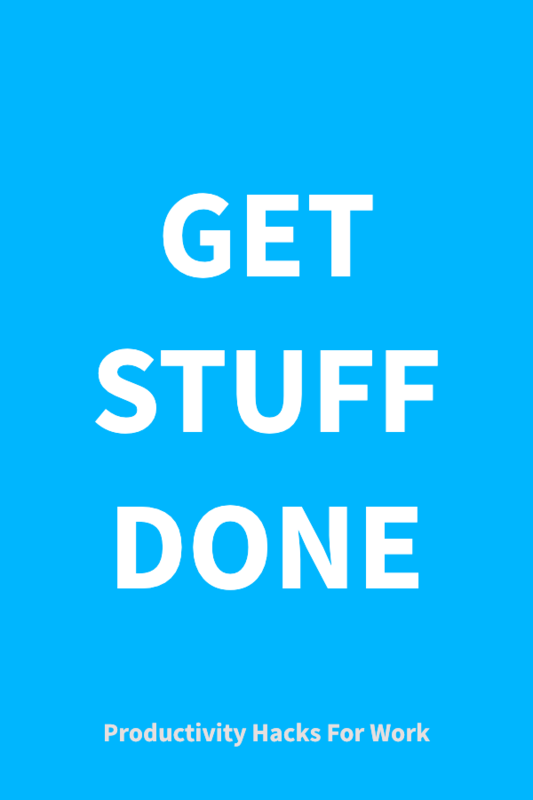 Getting stuff done or getting sh*t done (GSD) as bloggers more hip than I call it, isn't really about productivity hacks or anything like that. It's about following processes, removing distractions, and being mindful about your intentions. Do you really want to get more work done? Are you willing to sacrifice some addictive apps and habits? I used “hacks” in the title because I did my SEO research and I want more people to see this post. More views, less work. How's that for productivity? Productivity is a huge topic these days (in fact, it's trending). I believe most of this mania for more productivity comes from our always-on lifestyles. Look around and see people achieving so much in so little time. Overnight success stories just leech out of every social media channel and blog. And here's how they did it! Sorry, I don't buy a lot of this stuff. There comes a point where the search for productivity makes you less, well, productive. For example, when we waste time looking for the absolute best solution for a small problem, we have less time to spend on important goals. Let’s say you have a Customer Relationship Management tool that works well, but lacks a few features. These features could save you a few minutes every day. Before exploring the latest CRM options and sinking time and money into changing platforms, ask if you could avoid spending time in the search for the perfect solution and just work on something else. In the end, do you want to make more money or have a faster software package? Now if you enjoy looking at software, trying out new things, and learning how to use new products, go for it. But don’t kid yourself that it’s part of work. Consider it after-hours stuff. In the marketing world, where I spend a lot of time, new products come and go all the time. We're always looking for the latest and greatest tool. Marketers market to each other. And when it comes to new toys, it works. Sometimes sticking with what you already have is the most productive choice. Make your work environment somewhere to get work done. Duh! Remove clutter, non work-related distractions, and environmental factors that hinder work progress. Your office or workspace doesn't have to be a monastery, but it should be created to help you produce work. It should be comfortable and it should be welcoming. Like software choices, we can optimise our workspaces. But I’m more interested in making a Minimum Viable Solution. MVS is my version of the MVP term used by startups. MVP stands for minimum viable product and refers to a version of software or service that gets the job done without complex or expensive development costs. With MVS, the same principle applies. Create a solution that allows you to get work done and allows you to thrive. Add to the solution slowly. Find out what works and add and remove in small increments after that. Imagine sinking time and energy into a state-of-the-art work facility with specialized lighting, soundproofing, standing desks, and dehumidifiers, only to find you feel distracted there. The problem is that it could be something small but difficult to discern that prevents you from producing your best work. Small changes make the process of constant testing and evaluating easier. Interruptions are one of the biggest productivity killers. And I know from experience that working in an office can be a challenge. When you’re accessible, you start to expect interruptions. When anyone can walk up and chat with you, they will. Without noise cancelling headphones, the chat or loud conversations of your colleagues can be distracting. Once I worked in an open plan office with a guy who seemed to make it his priority every day to distract the whole office, for at least half the day. It ocurred to me that if management fired this guy, productivity levels would soar, despite having one less person on the team. If you’re the kind of person that gets distracted easily, or you can’t get back into the groove once interrupted, avoid the open office work environment. If you want to get real work done, avoid the open office plan. Work with a closed door. It doesn’t have to be an anti-social statement. You can be social and open to random chats. But make it clear to everyone that you’ve got time to chat. When you display an open-door policy, people take you up on the offer. The biggest airbags in any company are the ones that want to chat the most. Empty vessels make the most noise, and all that. Coworking spaces are an exception. As many coworking venues host solo entrepreneurs, small businesses, and teams from different companies, there’s less chance someone will just tap you on the shoulder. If you want to have a chat or do some networking (one of the main draws of coworking), use the break times, the lunch room, the smoking section, or any other place where you have an excuse to connect but you’re not interrupting someone or being interrupted. Did you know that some apps are designed not to demand your attention 24/7? Yeah, I know. Noisli is a favourite tool for helping me stay focused on work and keeping distractions away. It’s simple and to the point. The interface hasn’t changed in years but it was perfect in the first place. So why change? Here's how it works. Open the Noisli.com website, download the Chrome extension or install the phone app and click a sound icon. Choose from rain, wind, nature sounds, birds chirping, water flowing, and many others. Combine them and adjust the volume for a perfect fit. Slip away into a tranquil forest with just the hint of rain. Perfect for zoning in (or out). Some people work well with the sound of rain and thunder in the background. I find this helps by tricking my mind into believing that nothing interesting is going on outside without me. And I accept that I wouldn’t want to be there either. Back to work. The App is no longer free on mobile but the desktop version is still free to use. An alternative to Noisli, Coffivity focuses on coffee shop sounds. I find the background chat and clinking of coffee cups relaxing. It’s as if you're with people, but won’t be distracted by them. We're social animals and we crave company. So this is a mental trick to get the best of both worlds. Brain.fm is a tool for placing your brain firmly into the zone. The concept is simple but uses a bit of heavy science to make it work. Brain.fm enhances focus through “AI-generated music” built by scientists and musicians. Acoustic modulation and 3D spatialisation (best to listen for yourself) are the techniques used to induce a state of concentration, relaxation, or sleep, depending on your goal. It’s not something you’d stomp your feet to and definitely not music you’d want to play at a party, but that’s the point. The music is not the focal point. It’s supposed to help you focus on the topic at hand. Site blockers like the Freedom app and Chrome plugins like Site Block let you disable access to distractions. Planning on quickly checking your Facebook feed in between writing papers? You know that your “quick” check on Facebook can turn into 5 hours of unproductive, energy-sapping time wasting. So why not just block the temptation? No excuses. The Kill News Feed Chrome plugin for Facebook does what it says on the tin. It blocks your news feed on the social media platform. Why bother using Facebook at all then? Well, for many people in 2019, Facebook is a way to interact in groups about a topic. I’m not a fan of the platform but I'll admit that topic groups are useful. Internet forums, once so popular and useful, seem to have morphed into Facebook groups. With the exception of Reddit subreddits, it’s the place to go for the content we consumed on Forums 10 years ago. I’ll wager that most people’s Facebook news feeds display terribly unimportant ‘viral’ videos, photos of the children of people they hardly know, and ads. Would you miss it? I guarantee you will save hours every week by installing this plugin. And you won’t miss it. Remove Instagram, Facebook, Twitter, and whatever other social media platform you use from your phone. Drastic? Maybe. Useful? Absolutely. Imagine all the time you will spend thinking (remember that?) instead of scrolling through feeds of people faking it for likes. When you force yourself to only use these apps on desktop, you spend a lot less time on them, freeing up valuable hours for real work, friends, family, and your own personal interests. I did this. and I have to say, there’s no looking back. Nat Eliason, a clever guy with an awesome blog, believes that if you have to take regular breaks, then you’re not engaged enough and you need to work on something else. Others believe that short periods of work followed by a very short period of rest and brain resetting is more effective. There are countless blog posts about the Pomodoro technique showing how it's an effective technique for many people. But it's not for everyone. I find it works, but only under certain circumstances. There is research to show that humans are incapable of concentrating for longer than 25 minutes. On the other hand, Cal Newport, author of Deep Work has a few things to say about taking breaks and setting Pomodoro timers that are worth reading. The only way to find out if a sprints-and-breaks-type methodology works for you is through experimentation. The results are subjective, but if you find that the timer interrupts your flow when you’re writing, ditch it. But boring excel spreadsheet work calls for a break every 20 minutes or so, to refresh your weary brain. In this case, Pomodoro could be what you need. Don’t use Pomodoro as a crutch and don't use it as the answer to getting stuff done. Systems – Make it simple, stupid! I’m guilty of spending hours trying to find the best systems, the coolest tricks, and the nicest-looking software to help me be more productive and build systems to maintain this productivity. More often than not, this research fails to find me the best way to do things. What happens is that simple processes I'd already been doing continue to be part of my routine. If you're familiar with productivity apps and task management tools (which I lump together as similar categories), you'll have heard of Trello. It's one of the simplest task management tools. And it's free. So it's widely used in personal and business situations. There are better tools than Trello, but the app does a few things really well. It has a simple but intuitive interface that almost anyone can learn to use in minutes. Whenever I try a new app, I get excited and then abandon it shortly afterwards. Why? The usual reason is that they are not simple enough. Todoist is another tool I use (and love) for notes and quick tasks. It’s not perfect, and there are more sophisticated tools out there. But guess what? It does what it claims to do: makes task management easier. Apart from those two apps, I use a physical notepad. A good old-fashioned pen and paper. I love the little (tiny) kick of dopamine (I guess) that I get from running a line through a task on my paper to do list. The goal here is simplicity. There are bigger, better, more complicated, more complex tools out there that tackle the same problems but simplicity is beautiful and practical. It sets your mind free to relax. With some practice, the “monkey mind” quietens down when we remove the mental to-do list that nags us in the evenings. Plan ahead and then free yourself from wondering what to focus on the next day. When you write a task down, your mind liberates itself of any responsibility to store that reminder. The result is a refreshed brain that lets you be more productive the following day. When you wake up in the morning you can get straight to work. Sounds so simple, but it’s very effective. I learned this from Michael O’Neal of the Solopreneur Hour Podcast (An excellent podcast, by the way). Michael believes that journalling tasks the night before means you can get straight into the most important ones before distractions like email and Facebook start to creep in. And let's face it, delaying email and Facebook a few hours won't harm your business. I’m not qualified to test the difference between productivity levels in individuals who maintain a regular exercise regime and those that try to get stuff done without exercising. I only know from my experience that, having always exercised, it has helped me focus. I attribute a lot of the modest successes in my life to the regular practice of sport and exercise. It’s helped me to focus, to have more energy, and has given me the endurance to keep going. The human body has evolved to function at its best when there’s a regular component of exercise in life. Avoiding physical exercise to work more is counterproductive. Stop doing that! Tied into the concept of exercise is the concept of standing while working. Yeah, I know, standing desks are all the rage and you're thinking that you don't want to follow the herd. But let me tell you that these desks work. And it has nothing to do with weight loss or some kind of skinny body-inducing magic. I’m only interested in standing for productivity. I spent the last 5 years researching and testing the concept. In fact, I started a standing desk company, importing desk from China for resale to like-minded individuals. The concept of standing desks as a productivity hack came to me over 10 years ago when I read about a university in Scandinavia that had installed sit-stand desks for many of the students. I’ve always hated sitting and my discomfort created negativity towards my work environment. I’m no fan of the office, even to this day, but the act of sitting every day was making me miserable. And I associated this misery with my job. Working on side projects in the evening after work, I found it difficult to concentrate because I continued to sit when I just wanted to stretch my legs. Standing desks solved this problem. Using one every day, I find my energy levels and mood improve drastically. I can work for longer and don’t feel that annoying discomfort in my hips or lower back that sitting so often causes. Get a standing desk and boost your productivity. This is one of the hardest things to get right. Humans love to achieve things. No matter how small they might be, ticking that box to say you’ve done something is a dopamine hit. A reward for doing little is still a reward. The marshmallow test claims to prove who will be successful in life based on a test which measures a child's ability to delay self-gratification. And it might be true that the adult who can postpone the back-slapping and tiny rewards in order to achieve bigger things will also be more successful. Bigger things come from a much larger sacrifice of time and energy. There’s no way around it. But you can set yourself up to remove the distractions of tiny wins that don’t move the needle. Of course, once you’ve ticked off the most important tasks, or the ones that will move you forward, you can knock off a few tiny tasks if it makes you feel good. But it’s important not to burn off your energy and enthusiasm on things that distract from the big picture. The ability to write effectively is one of the most valuable skills an entrepreneur can have. I make it a point of writing every single day. But I find it difficult to do after lunch. Even the best writers struggle with the afternoon slump. In the book, Daily Rituals: How Artists Work by Mason Currey, the artists and entrepreneurs profiled generally agreed that the after lunch period was the least productive of the day. From personal experience, I agree that the hours between 1 pm to 3 pm are useless for writing. If I get a few emails sent out, I’m ahead of the game. After the standing desk bit, you’re probably rolling your eyes at the thought of me pontificating on the positive effects of sleep on productivity. But hear me out. Some people sleep less than the recommended 8 hours because, well, they believe that they manage well without. But are they sacrificing creativity and memory for the sake of an hour or two of sleep a night? Read the book Why We Sleep by Matthew Walker and tell me if you haven’t changed your opinion of the value of this thing that takes one third of our lives. Sleep is a vital element of learning, creativity, memory building, and a whole lot more. Getting a good night’s rest will help your brain even more than your body. Why We Sleep is not only a deep dive into sleep and why we need it, but it offers practical advice for getting more quality shut eye. “Quality” is the important word here. There is no substitute for quality in the world of sleep. I’ll go as far as saying that, if you want to be productive, heading to bed at a reasonable hour (before midnight) and rising at least 8 hours later will do more than all of the other tips combined in this list. I left the best tip to last.